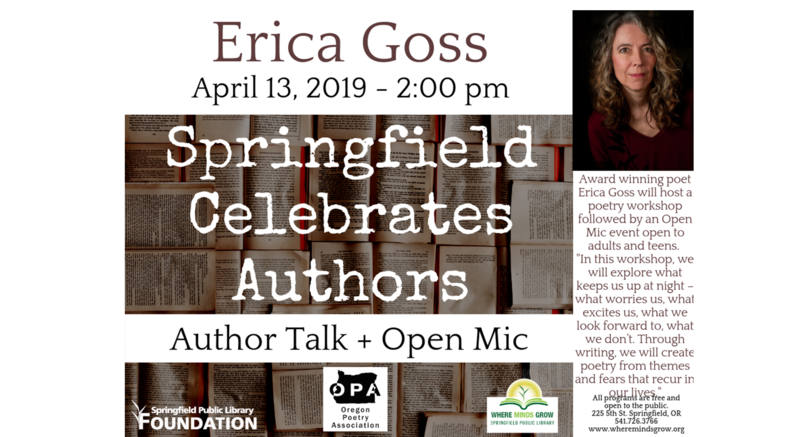 The Springfield Public Library is proud to offer an open invitation to both adults and teens to take part in a workshop with award winning poet Erica Goss and then sharing your work at an Open Mic (or just listen if you prefer!). With support from the Springfield Library Foundation and the Oregon Poetry Association, Goss will present an opportunity to “explore what keeps us up at night – i.e., what worries us, what excites us, what we look forward to, what we don’t. Through writing, we will create poetry from themes and fears that recur in our lives”. Following the workshop participants will be able to take part in a short Open Mic. Springfield Celebrates Authors is an annual series presented by the Springfield Public Library highlighting local, national and international authors. Over the course of five months patrons can hear from published trail guides, essayists, poets, Young Adult Authors and Sports Journalists. The next Springfield Celebrates Authors event will feature Austin Meek, sports journalist at The Register-Guard on Saturday, May 11 at 2 p.m.